Provide comfort for the family of William Lapchuk with a meaningful gesture of sympathy. 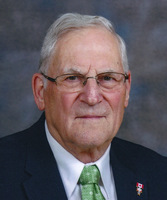 On April 4, 2019, Bill Lapchuk of St. Albert passed away at the age of 82 years. Bill is survived by his daughter, Andriana (Jeff) Klotz; cherished granddaughter, Alyssa; brother, Bennard; and devoted friend, Lois Balko. Predeceased by his wife, Lena. Prayer Service Wednesday, April 10 at 7:00 p.m. at St. Basil’s Ukrainian Catholic Church, 7007 – 109 Street.